Please use the drop down menu for a sneak peek of the types of clocks we carry. Contact us to confirm the item is in stock before purchase. Also, please ask online orders guidelines and requirements as well as exact amount of shipping fees prior to mailing. Check on availablity, this is a consignment sale. Thanks to the Jaeger-LeCoultre wesbsite, please read: The Atmos clock is a very high-precision instrument manufactured with technologies that only the Jaeger-LeCoultre master-clockmakers are capable of handling. All the components of the Atmos clock are amazingly accurate and dependable; hence it has virtually wear-free operation. It is therefore distinguished by its long service life which - theoretically - can be as long as 600 years. Because of the current state of air pollution, however, regular checks and services are recommended at one of their approved service centers. The power needed for this clock to operate is extremely low, which means that your Atmos® clock must be placed on a completely stable horizontal support (chest of drawers, console, etc.) to ensure optimum operating conditions. Once started, the clock should not be moved: cleaning the cabinet or the base should be carried out without handling or moving the clock. If, however, your clock must be moved, it is essential to lock the balance. To do so, push the balance blocking lever to the right up to the thrust stop. This locking procedure must be carried out when the balance wheel stops before oscillating back in the opposite direction. Setting the time To set your Atmos clock to the right time (and also for the summer/winter time change), move the minute hand forward with one finger. Note: never turn the minute hand anti-clockwise and never touch the hour hand. Make sure that the balance is locked before setting your clock. Price does not include shipping. 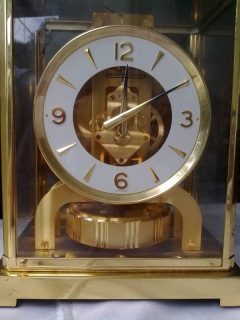 French Clock design 14" brass, very heavy and very nice! Price does not include shipping. This is our favorite clock in house. I'm sure this clock is worth a lot more. Please check on availability to see if we still have in stock before purchase. Price does not include shipping costs. The face of this clock slides and you can place keys inside. Please check on availability to see if we still have in stock before purchase. Price does not include shipping. Please check on availability to see if we still have in stock before purchase. Price does not include shipping, Please check on availability to see if we still have in stock before purchase.